On April 29, a performance event cosponsored by the Latin American Institute and the Center for Brazilian Studies will explore theater and incarceration in Brazil. International Institute, April 24, 2014—“Andy will be dancing the history of Cuba’s national ballet in two minutes and 15 [seconds].” That is all that Ashley Lucas and Andrew Martinez would reveal about the performance that they will co-present next Tuesday, April 29, at 7:00 pm in Glorya Kaufman Hall. In what promises to be a fascinating blend of scholarship and performance, the event will explore their research on theater in Brazilian prisons.Their performance, cosponsored by the Latin American Institute and the Center for Brazilian Studies, is the final installment of the Visual and Performing Arts Education Program (VAPAE) Lecture Series of the UCLA School of Arts and Architecture. 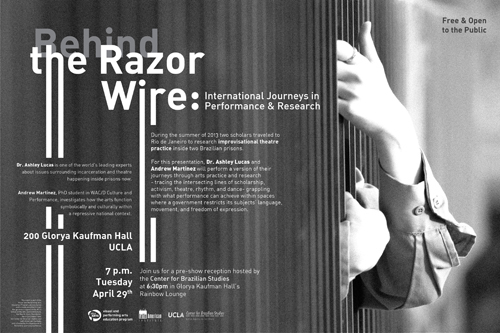 Hosted by the department of World Arts and Cultures/Dance (WAC/D), “Behind the Razor Wire: International Journeys in Performance and Research” is also sponsored by the UCLA Department of Art, School of the Arts and Architecture, the Max H. Gluck Foundation and the UCLA Dream Fund. The event aims to engage students in a conversation about art as a vehicle for sharing knowledge. A discussion session moderated by leading Chicana/o theater scholar Jorge Huerta (professor emeritus of drama at UC San Diego) will follow the presentation. Ashely Lucas is an associate professor of theatre and drama and director of the Prison Creative Arts Project at the University of Michigan. The program trains people to create arts workshops in high schools, prisons, juvenile facilities, and communities of prisoner re-entrants and crime victims. She is one of the world’s leading experts on incarceration and theater performance in prisons, as well as a playwright and actor. Andrew Martinez is a PhD student in UCLA’s WAC/D Culture and Performance Department, where he researches the symbolic and cultural function of art in repressive national contexts. He studied musical theater as an undergraduate and is also trained in classical ballet. In July 2013, the two scholars traveled to Rio de Janeiro to research improvisational theater performance inside two Brazilian prisons as part of an exchange program between the University of Michigan and the Universidade Federal do Estado do Rio de Janeiro. They were recruited by Barbara Drucker, associate dean of the UCLA School of the Arts and Architecture and director of the VAPAE Program, to present their experiences at the UCLA-wide lecture. After traveling to Brazil, Lucas and Martinez decided to present a retrospective of their journeys and research. The performance will seek to “make the hidden logic and discipline of the prison more visible,” said Lucas, “and to engage different publics in a conversation about how mass incarceration affects people all over the world.” It will also prompt audience members to “consider the different ways that knowledge is produced and disseminated,” added Martinez. Prison, they note, is a contradictory performance space. “We perform to be seen, yet prison itself strictly limits that basic process of reaching audiences,” explained Lucas. Both scholars confront this paradox in their research and are working to explore it more directly through a live-audience performance. “Our lecture addresses issues of arts practice in confining circumstances,” said Martinez. It will “portray a world of performing arts which remains largely hidden from the general public,” agreed Lucas. Tuesday’s event will also serve a broader purpose: to encourage community engagement and facilitate arts education for marginalized populations. “Both Ashley and I are committed to fostering underrepresented students in undergraduate programs,” said Martinez, who hopes that the lecture will inspire UCLA students who may not have previously considered art as a means of sharing knowledge. This sentiment is at the core of the VAPAE Program at UCLA, which seeks to introduce UCLA undergraduates to the field of arts education. Dean Drucker inaugurated the program as the first school-wide minor of the School of Arts and Architecture in 2010, in part to promote arts education in K–12 schools, summer programs and incarceration facilities. “There is a huge need for arts programs in correctional institutions,” she said. The April 29th lecture is part of VAPAE’s initiative to encourage students and professional artists to engage in community activism. Through their performance, Lucas and Martinez hope to cross the artificial boundaries between the arts, scholarship and activism, encouraging us to consider incarceration from a new perspective. At the very least, audience members can expect to walk away with a danced history of Cuba’s national ballet danced in two minutes and 15 seconds. International Journeys in Performance & Research"
For more information and parking instructions, click here.